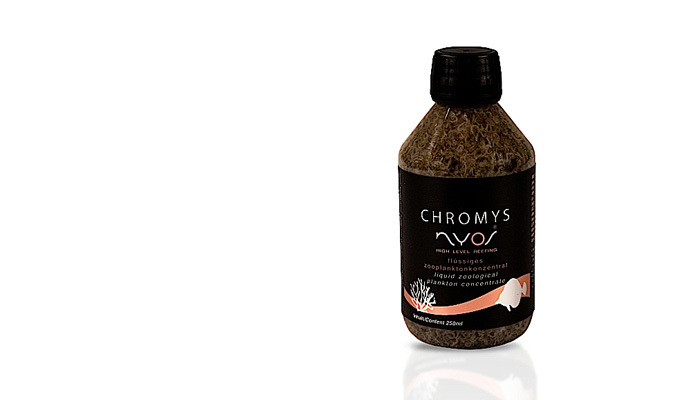 With Nyos® CHROMYS you get a liquid zoological plankton concentrate which can be used directly. CHROMYS contains high-quality Mysis relicta (0,2-20mm). This provides ideal nutrition for numerous seawater fish and LPS corals. CHROMYS strengthens seawater fish vitality and accelerates coral growth. Recommendations for use: CHROMYS can be fed directly, for example by means of a pipette or dosage cup. Alternatively, CHROMYS can first be diluted with aquarium water in a separate container and then added. Feed fish sparingly many times a day. Feed LPS corals with a pipette after turning off the current 1-2 times per week, directly and in small amounts.